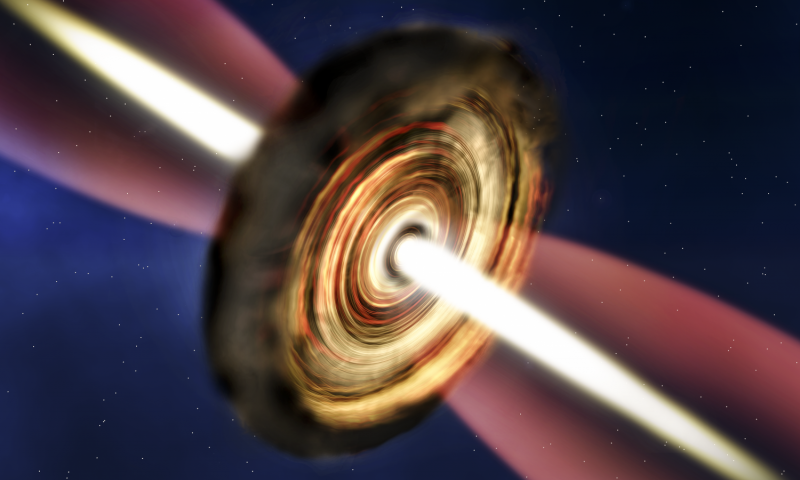 This star has an insatiable appetite for space dust. Astronomers have their eyes on a young star around 11,000 light-years away from Earth, and for very good reasons. The massive young star, G11.92-0.61 MM1, or MM1 for short, is in our galaxy and reached its size faster than normal stars. “An average star like our Sun is formed over a few million years, whereas massive stars are formed orders of magnitude faster – around 100,000 years,” said team leader John Ilee, from the University of Cambridge in the UK. The finding, published in the Monthly Notices of The Royal Astrological Society, is a rare one because while the dense clouds of molecular material make stellar nurseries perfect for birthing stars, those clouds of space dust make it very hard for normal telescopes to see through the clouds. Being able to watch this young star mature is an exceptional chance to monitor and better understand a massive star’s lifecycle. Artist’s impression, MM1. Credit: A. Smith, Institute of Astronomy, Cambridge. Using the combined powers of the Submillimetre Array (SMA) in Hawaii and the (aptly named) Very Large Array (VLA) in New Mexico, which offer longer wavelengths than most telescopes, the team not only managed to spot the star but also to assess its surroundings. At a young age, MM1 is already over 30 times the size of the Sun…and it’s still hungry. And it seems the MM1 still has a front seat to a full buffet, as calculations show a large disc of matter surrounding it. This is called a Keplerian disc, thus named for the law of motion it follows. Particles closer to the star move faster than those on the outer edges. So what else is on the table for MM1 (apart from lots of star food)? Well, death. From what we know of stars, the faster they eat (and the more they do), the sooner they die. This makes finding them in their early stages of death by gluttony a rare occurrence. “These massive stars also burn through their fuel much more quickly, so they have shorter overall lifespans, making them harder to catch when they are infants,” Ilee says.